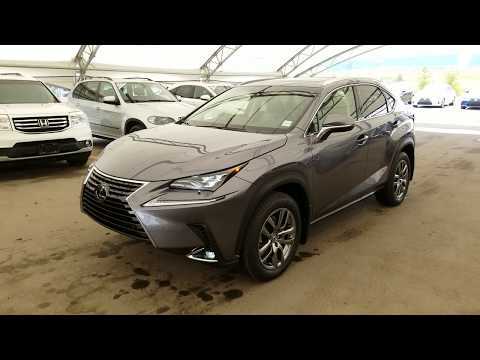 Premium Package + Lexus Navigation, Enform Destination Assist (1 year subscription), 10.3" display audio screen, 10 speakers, clearance and backup sensors with rear cross traffic braking, remote touch interface, rain sensing wipers, LED high beam, premium triple-beam LED headlamps, auto levelling headlamp system, Shimamoku woodgrain trim, leather seat surfaces. Engine: 2.0 litre, 4-cylinder, 235 hp, DOHC, 16-valve, dual Variable Valve Timing with Intelligence (VVT-i), turbocharged, intercooled, Atkinson cycle, Direct-Injection 4 Stroke gasoline engine / superior version turbo (D-4ST). Drivetrain: All Wheel Drive (AWD), Vehicle Stability Control (VSC), Traction Control (TRAC), Hill-start Assist Control (HAC), Drive Mode Select (Sport, Eco and Normal modes), dynamic torque control system. Transmission: Transmission water-to-oil cooler, automatic, 6-speed, Super Electronically Controlled Transmission (Super ECT), lock up torque converter.